"They say she was beautiful. A dream. But for all her good looks, she was also a killer." The story of the fighter plane and pilots that helped win the Battle of Britain in World War II. Spitfire is already playing in cinemas in the UK, but we haven't featured this trailer for it yet, so better late than never. David Fairhead & Ant Palmer's documentary Spitfire is an examination of the British fighter plane, that was used heavily by the British in WWII. It's also the plane that Tom Hardy flies in Dunkirk, for reference. Spitfire also explores how this extraordinary plane thrives today and how it has become an international icon. This film looks like much more than just a historical doc or an engineering doc, and there's some spectacular footage in this trailer alone. I'm really looking forward to catching up with this film, hopefully sometime soon. See below. Spitfire is an epic, sweeping tale of determination, vision and courage. It is the story of an aeroplane that was forged in competition, shaped as the war clouds gathered, and refined in the white heat of combat – going on to become the most famous fighter plane ever made. Credited with changing the course of world history, this is the story of the Spitfire – told in the words of the last-surviving combat veterans. With stunning aerial footage from the world’s top aviation photographer, the film also contains rare, digitally re-mastered, archive footage from the tumultuous days of the 1940s when her power in the skies was unrivalled. Spitfire is co-directed by filmmakers David Fairhead (Mission Control: The Unsung Heroes of Apollo) and Ant Palmer (Hidcote: A Garden for All Seasons). The film hasn't premiered at any film festivals as far as we know. 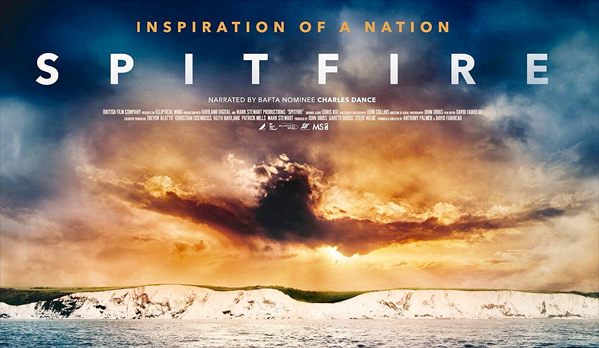 Altitude Films already released the Spitfire doc in UK cinemas on July 15th and is now available on VOD. No US release date is set yet - stay tuned for updates. Who wants to see this film?